Both AT&T and Verizon announced Thursday that they will begin selling Apple's iPad in their brick-and-mortar retail stores on Thursday the 28th, with the latter offering the device in conjunction with its MiFi mobile hot spots. AT&T said all three iPad Wi-Fi + 3G models will be available at more than 2,200 AT&T Stores starting October 28. The wireless operator said it will be pitching the tablets alongside its 3G pre-paid data plans complete with Apples easy on-device activation and management. Plans start at $14.99 per month for 250MB and $25 per month for 2GB with no term contract. Both plans include unlimited access to AT&Ts 23,000+ domestic Wi-Fi Hot Spots. The iPads themselves will sell for Apple's suggested retail price of $629 for the 16GB model, $729 for the 32GB and $829 for the 64GB. For its part, Verizon will offer only the WiFi versions of the iPad, bundling them with its Verizon MiFi 2200 Intelligent Mobile Hotspot routers for a suggested retail price of $629.99 for iPad Wi-Fi 16GB + MiFi, $729.99 for iPad Wi-Fi 32GB + MiFi and $829.99 for iPad Wi-Fi 64GB + MiFi. Verizon is offering a monthly access plan to iPad customers of up to 1GB of data for $20 a month. In addition, the carrier will also offer all three iPad Wi-Fi models on a stand-alone basis. 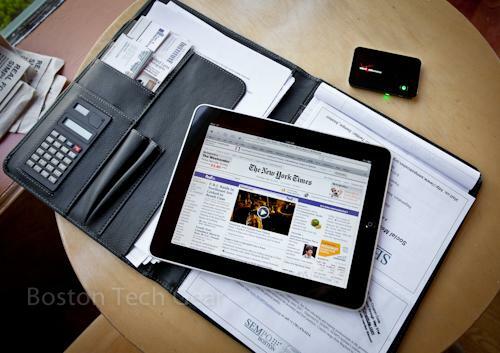 Verizon's MiFi 2200, pictured above, is small enough to fit in a pocket and allows users to create a personal Wi-Fi cloud capable of sharing the high-speed Internet connectivity of the Verizon Wireless 3G Mobile Broadband network with up to five Wi-Fi-enabled devices. The MiFi 2200s rechargeable battery provides up to four hours of active use and 40 hours of standby time on a single charge.